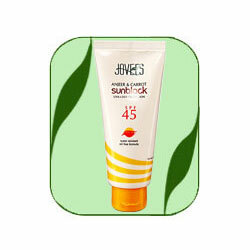 Jovees water based Sun Block cream developed scientifically using the modern production techniques that help to preserve the integrity of herbs thus ensuring formation of a thin layer over the skin thus protecting it from the harmful effects of UVA & UVB rays. The herbs used include Anjeer, Carrot and Sandalwood along with natural Vitamin E. This sweat and water proof sun block cream with SPF-45 will also help improve skin texture & complexion while maintaining the moisture balance. Apply evenly all over face and to the skin exposed to the sun. Leave on. Useful for all skin types. Ficus, Liquorice, AloeIndica, Sandalwood & Wheatgerm.